2015!!! Happy New Year! I can't believe I am actually writing a blog post for 2015. I feel like 2014 just started!!!! LISTENING…Right now, it's 12:42am and I am watching Property Brothers. Can I just say these men are so incredibly good looking!!! Hubba hubba!!! While I am watching this, my washing machine is going. It's been going, and going, and going…for HOURS! I have been getting everything clean since I have been in quarantine for the last 3 days…. THINKING….One of the things I said I was going to do while I was in this lockdown was to grade papers. Yeah…that didn't happen. I guess I will be working on them over the course of the next few days to get them done!!! :) Ooops. 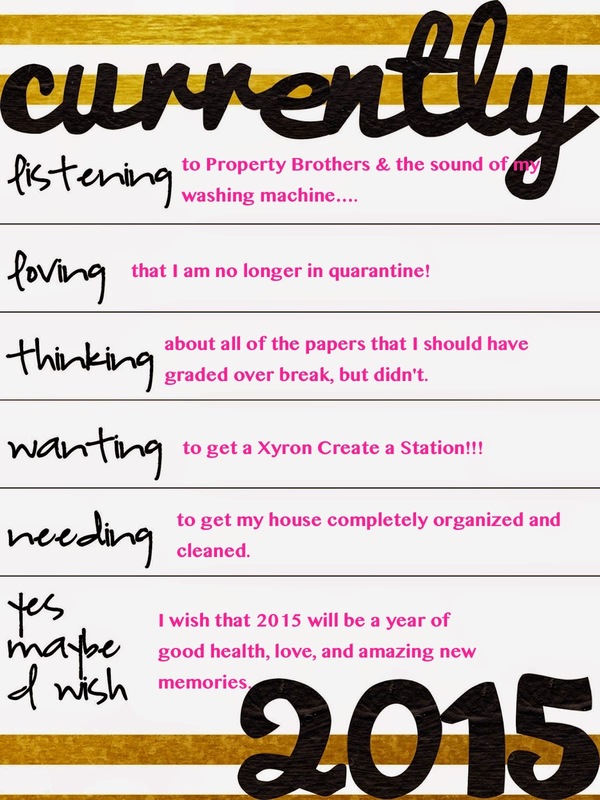 WANTING….I REALLY want the Xyron Create a Station machine! Actually, I realize now it's called a Creative Station. I will be ordering one this week off Amazon! I can't wait to start creating! I will be sure to share some of my creations in a future blog post!! NEEDING….My house needs to get to a point of clean that makes me happy. It's not there yet. I am hoping that some time in the near future I will be able to get rid of the clutter and get this place up to par! WISH…My wish for 2015 is good health, love, and many new memories. Not only for me, but for all of you too! Happy 2015 to each one of you! Thank you so much for following my blog. It means a lot to me to know that I might be making an impact on someone out there! Hi!… found you through Farley. Your blog is super cute! I am also trying to de-clutter and get organized. I hope to spend the last week of break getting rid of things I don't need. I am sorry you are going through health troubles… wishing you a healthy year ahead!